Bill Ivester had a passion for all things outdoors and he was most content and happy when near the ocean or flying in the skies while training to obtain his pilot's license. Bill now knows the depths of the ocean and the limitless boundaries of the sky. Bill passed away on October 22, 2018. He was 47. William P. Ivester was born September 22, 1971, a son of the late James M. and Geraldine A. (O'Brien) Ivester. Raised and educated in Medford, Bill graduated from Medford High School with the class of 1990. 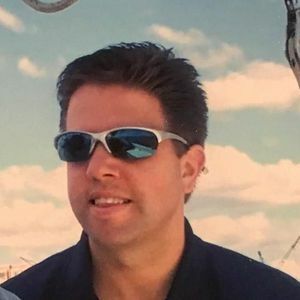 He studied and earned his Bachelor's degree in Architecture from Wentworth Institute in Boston and worked within his field of study in various roles throughout his career. His interests always remained in architecture. He could easily determine the architecture of a building and welcomed a road trip to explore new sights and buildings. His daughter Elyse was the keeper of his heart. In addition to his daughter, Elyse and her mother, Stephanie Hyde he leaves his siblings, Laurie A. Ivester Voto of Bedford and Deborah M. Ivester Ryan of Woburn;his niece and nephew Ryan Voto and Kaitlyn Ryan as well as aunts, uncles and cousins. What a beautiful tribute to Billy's life. My deepest prayers to the Ivester family. Life Stories provides friends and families a forum to post their favorite stories and memories of William P. Ivester ensuring the precious experiences are never forgotten. Share joyful times, post a photo that captures the moments you cherish, and allow others to reply, relive and remember.